USDJPY is under the influence of some economic reports such as Economy Watchers Sentiment, Current Account, Core Machinery Orders m/m and Bank Lending y/y data in Japan and Consumer Credit m/m and Labor Market Conditions Index m/m in the US. 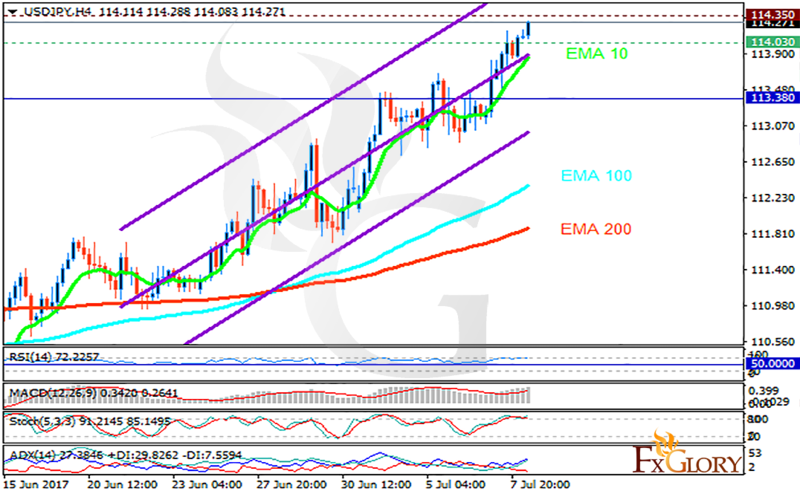 The support rests at 114.030 with resistance at 114.350 which both lines are above the weekly pivot point at 113.380. The EMA of 10 is moving with bullish bias along the ascendant channel and it is above the EMA of 100 and the EMA of 200. The RSI is moving in overbought area, the Stochastic is moving in high ranges and the MACD indicator is in positive territory. The ADX is showing buy signals. Bulls are controlling the chart therefore buyers can target 115.